The U.S. ambassador to Mexico is leaving at a pivotal moment. The U.S. ambassador to Mexico is retiring amid tense relations between the two countries - another loss of a senior American diplomat. Amb. Roberta Jacobson announced on Twitter that after 31 years of government service, she is leaving in May. A State Department official told ABC News she is resigning her position and will retire from the civil service shortly thereafter. It's another loss of a top diplomat for the State Department - the second this week after U.S. Special Representative for North Korea Joseph Yun announced on Tuesday his sudden retirement. Her departure also comes at a pivotal moment for U.S.- Mexico relations, with the seventh round of NAFTA talks underway this week and Mexican concern over new steel tariffs just announced by the White House. Tensions are high over President Donald Trump's proposed border wall as well after a phone call between Trump and Mexico's President Enrique Peña Nieto that ended with Peña Nieto canceling a planned visit to the U.S. Trump has said Mexico will pay for a border wall and blasted the country for sending drugs and crime to the U.S. - two things Mexico denies. 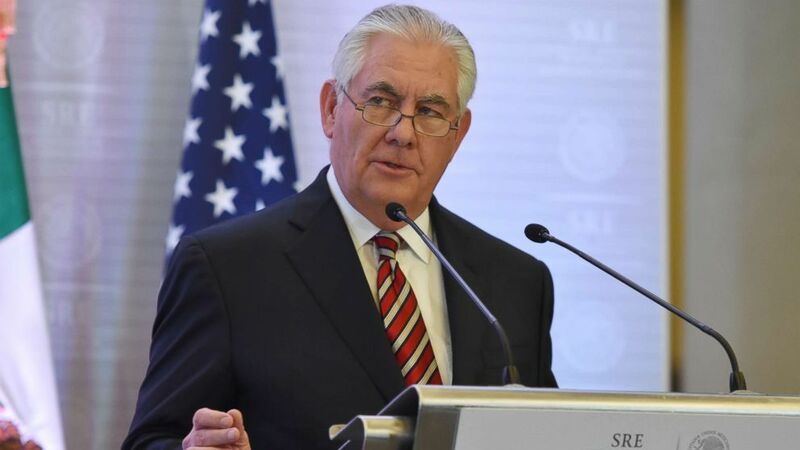 (Carlos Tischler/REX/Shutterstock) U.S. Secretary of State Rex Tillerson visits Mexico, Feb. 2, 2018. It's unclear if the administration has anyone ready to replace Jacobson or knew her departure was coming. The Trump administration has been criticized for being slow to fill ambassadorships, with vacancies in key posts, including South Korea, Turkey, Jordan, Saudi Arabia, Egypt, and the European Union. State Department spokesperson Heather Nauert said Thursday that the department was thankful and grateful for Robertson's service, but that there are other experts who could fill the role. At only 57-years-old, Jacobson is another top diplomat leaving before usual retirement age. Her counterpart in Panama, Amb. John Feeley, announced his resignation in a letter to staff that was obtained and published by Reuters. He is scheduled to depart his post next week. Other top diplomats have also announced they are leaving - including Under Secretary of State for Political Affairs Tom Shannon, the third-highest-ranking official at the department - leading the foreign service union's president to warn:, "Our leadership ranks are being depleted at a dizzying speed." 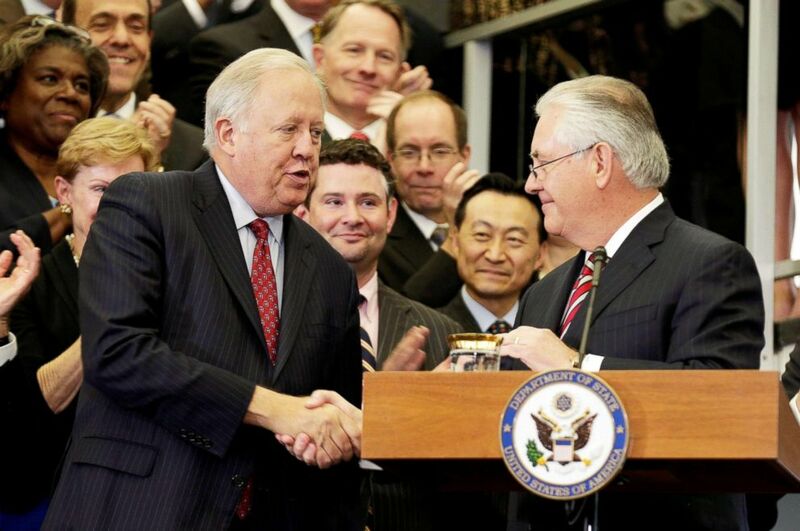 (Joshua Roberts/Reuters, FILE) U.S. Secretary of State Rex Tillerson shakes hands with acting U.S. Secretary of State Tom Shannon while delivering remarks to Department of State employees upon arrival at the Department of State in Washington, Feb. 2, 2017. Some have made their frustrations or disagreements very public, too, including David Rank, the top official at the U.S. embassy in Beijing, who resigned over Trump's withdrawal from the Paris climate accord. But when asked about the vacancies, Trump told Fox News they didn't matter: "I'm the only one that matters because, when it comes to it, that's what the policy is going to be." Nauert said Thursday that the administration was not concerned by the departures, noting many of the recent departures had served for over 30 years. "People should be promoted in their careers, and we look to the future generations of people who are younger in this department to be able to bring them up through the ranks. Do you want somebody around forever?" spokesperson Heather Nauert said during the department's briefing, adding that new people should be promoted. She deferred questions about filling those roles to the White House. With the news of her departure, Jacobson received praise for her years of Latin America experience and knowledge. "Whether it was Mexico, Colombia, Cuba and more - Roberta demonstrated the difference diplomacy can make to advance American interests and build peace," tweeted former secretary of state John Kerry. "Was lucky to have her on America's team." The top Democrat on the Senate Foreign Relations Committee, Sen. Bob Menendez, a New Jersey Democrat, who clashed with Jacobson over Cuba, praised her service and excoriated Trump for "the exodus of expertise from a State Department suffering under poor management and dangerous political guidance." Jacobson did not say what she will do next, but said she is leaving "to pursue other opportunities" and departs "knowing the U.S.-Mexico relationship is strong and vital and that this amazing Mission Mexico team will continue to ensure it remains so."